The regal Leo man will be smitten into the heart of the tender modest woman Aquarius. Relationships will take the turn of cool unfolding events, mutual interest. The Leo-man loves the public, to be in sight. It is very popular among women. Leo is an extraordinary handsome man, a chic, luxurious man. The Aquarius woman will easily lose her head from such a man, in her dreams from a youth it looks exactly like Virgo man. He is benevolent, courteous, intelligent, educated. He is able to find an approach to the delicate, vulnerable girl’s soul of Aquarius. In the society of the Leo man, the Aquarius woman is able to change in many ways. It becomes less careless, more profound thoughts, philosophical conclusions, it is more focused on his person. Aquarius girl, striving for a bright and noisy rest, now dreams of seclusion with only one person. The Aquarius woman appreciates in Leo the openness of the soul, softness, the ability to take responsibility for solving problems on oneself, to manage situations in difficult moments of life. Aquarius is lucky, her Leo man is very generous, does not skimp on expensive gifts and overseas rest. In relationships, romantic reigns, gentle tender words do not run low, a more quivering couple is hard to find. Aquarius is an attractive, sociable, cheerful, good-natured woman. In her more light attitude to life, easier to look at life. The Leo is accustomed to a comfortable life, he needs to surround himself with luxurious things, expensive interior. Perhaps, quarrels may arise on this ground, but given that Leo is an astute nature, he will sooner be reconciled with the partner’s mismanagement than he will spend time re-educating. His way of life is subordinate to the order, the schedule, especially it is noticeable in the mature man held. Most likely, Leo will take up managerial positions, engage in organization and entrepreneurship. What can spoil the relationship, is the inconstancy and uncertainty of the Aquarius woman. She slopes change opinions, hesitate for a long time in a simple choice, often inattentive, does not analyze her mistakes. All reproaches the man perceives with hostility, harsh words cause tears, hysterics, accusations of tyranny and excessive severity. In order to keep the union, a long love relationship, it is worth to get carried away together with a common cause, connected with creativity, art, interests not related to "figures". Their road to mutual happiness lies not through peace, pacification, but rather life-filled with impressions. According to the compatibility of the Aquarius woman and the Leo man in their family union, there are many contradictions and that the family life lasts long and happily, they need both to exercise conscious patience and restraint. Aquarius and Leo are opposite signs and therefore can perfectly complement each other, of course, if they do not have patience before they can find a common language. A Leo man is difficult to reconcile with the fact that the Aquarius woman does not want to stay at home and do household chores. Relations between the Aquarius woman and the Leo man rarely begin with "love at first sight". Both partners need time to feel their feelings, but these relationships do not end right away. The period of courtship in this pair can also be prolonged, but, despite the fact that partners already have time to somehow rub themselves together, their relations can not be called simple. 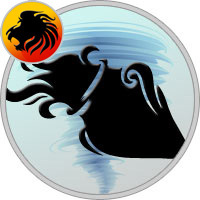 The Leo man is very energetic, and the Aquarius woman is very unpredictable, so they will not have a quiet family harbor. In these relations there are always many living, bright, unusual and amazing feelings. Also in this union there are many fantasies and cunnings, wickedness and humor, original intimate amusements. By the way, many problems can be solved by partners in bed. Under the blanket many contradictions are simply disappearing. And a strong bodily attraction over time smooths out sharp angles in views and opinions, in beliefs and worldviews, in temperament and in characters. In an ideal pair of the Aquarius woman and the Leo man, each partner finds what he was looking for. Aquarius acquires much-needed support and can calmly give him all the responsibility, even for his life. A man-Leo appreciates the Aquarius woman for her sincerity and kindness, because she feels that there are a lot of flatterers in his life. The ideal couple of the Aquarius woman and the Leo man often attends public events. Both love active social life and are engaged in charity. Being engaged in charity, sponsorship, the man Leo gets his share of recognition and admiration, and the Aquarius woman enjoys simply improving her world. Also, a compatibility of Aquarius-Leo pair likes to arrange various events. The Leo-man enjoys his royalty, strives to give shine and luxury to everything. A woman-Aquarius is able to make so that each event was original and cute, having its own "zest". The main problem of the compatibility of the Aquarius and Leo Zodiac signs is that the Aquarius woman perceives the behavior of the Leo man as hypocritical. The Aquarius woman is used to behaving naturally and openly. If she has a bad mood, then this does not hide from others. A man-Leo on the contrary, it is important for him not to lose his "face". Therefore, if suddenly during the quarrel guests come, he will be cheerful and cheerful, as if nothing had happened, despite the fact that a volcano was raging a minute ago. The woman-Aquarius displeased this behavior and she considers it two-faced. Explain to the Leo man she will not be able to, because he has a clear position on this matter: to lose his temper in public is shameful and ugly, besides, one should not devote others to his seminal affairs. The Aquarius woman is naive, and at first it can be considered that the scandal is over, since the Leo man smiles. But, no matter how, as soon as guests leave the house, Leo will again "growl" and a bad mood here, and return to him. A woman-Aquarius is very irritating. To take revenge on the Leo man, she will show coldness towards him, create a distance and will in every possible way ignore his bad mood. This behavior will only complicate the situation, and a "fire" can break out with renewed vigor. A man Leo does not forgive when he is not noticed. According to the horoscope of compatibility of Aquarius and Leo, so that in their family there was harmony, first of all, the Aquarius woman needs to learn not to take offense at the Leo man. If you really consider it two-faced, then remember how many times you got into an embarrassing situation just because you could not contain your feelings? Surely you did not like your behavior, and you would like to change. So, Leo is just an example of another behavior. In addition, one must respect the opinion of each person. If the Leo man believes that he is doing the right thing, do not try to convince him. After all, you most certainly need to be happy, not right.